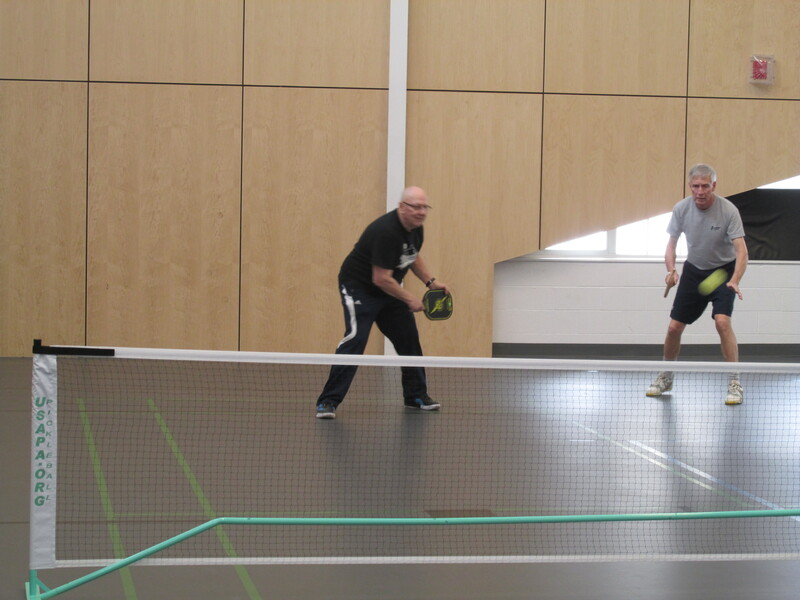 Ron Lemon, at left, is poised to return a volley during a recent pickleball match. I have been in a jam or two before. But now I am in a pickle. I have a Lemon to thank for it. The pickle is about a sport called pickleball. Do I want to become a pickleball athlete? That’s the pickle I am in. Though not yet at Olympic heights, pickleball is growing so rapidly in popularity it is one of the fastest growing sports in North America especially among seniors. So says my mentor, Ron Lemon, as we drive from Welland to Port Colborne for our Tuesday afternoon matches at the strikingly handsome Vale Health and Wellness Centre. “It’s catching on big with seniors,” says Lemon, a senior statesman with celebrity status: He is married to the world-class triathlete, Lynda Lemon. The statesman says because I am already in the age demographic, I should get in on the ground floor ahead of the oncoming wave of picklers. Wait a second: Picklers? Is that what pickleball athletes are called? Wait another second: Are we athletes? The game is played on a court similar to a badminton court and it has some of the rules of tennis although they are changed slightly. A wood paddle, not a racquet is used and the yellow ball is plastic and has holes – perforations is the official description, not unlike the Wiffle ball baseball. On the days we have been at the courts, the number of players has ranged from six to 14. The game can be played by two players or four – singles or doubles, as the jocks would say. It has terminology well worth reading. I now know the meaning of dink (no, it is not what you call an opponent on the other side of the net: “Hey, you dink, that serve was in play!”), foot foul, poach and other pickleball pecadilloes. My mentor is cool as a cucumber when it comes to this game. His serve is so elegant, so Ruthian I have taken to calling him the Sultan of Serve. He is helping to organize a district competition, probably in early June. Me? I look forward to the end of the hour, when I call it a day and watch the proficient picklers from a bench at courtside. So I am torn between playing to become a proficient pickleball pickler, and participating just for the fitness aspect. The stretching and bending can be torturous, especially for those of us who do not do much of either, especially during winter. For the moment, I am stretching toward the latter of the two options. I am bending in favour of it. By now you know the pickle I have been in, the dill-ema I have had. Do I become a serious pickler like my mentor, the Sultan of Serve, or do I just go for the exercise? It’s been a battle: Back and forth, back and forth, like a sustained volley in a good game of pickleball. Well, I am putting an end to this waffling once and for all. I am not going to stew about it any longer. I am no longer in a pickle. I will play pickleball with what it takes. Relish. Soot the cat hides beside (and sometime, behind) the Snoopy doggie-treat container to cast a watchful eye on birds in shrubs and bushes below our bay window overlooking First Avenue in north Welland, near the Niagara College campus. My lasting image of Frank Addario is one of Mr. Addario and his wife, Eleanor. They are arriving for 8:30 a.m. Sunday Mass at St. Kevin’s, their long-time parish. I see them walking across the foyer, side by side, arm in arm, stopping occasionally to exchange greetings with fellow parishioners before making their way into the church, favouring a pew near the front. Exemplars of lives well lived, their side-by-side togetherness characterized the closeness of their married life, 62 years. Frank Anthony Addario, a much admired Wellander, died Friday, February 14, 2014, aged 92. His funeral Mass was celebrated Saturday, February 22, 2014 at his parish church. The death notice for Mr. Addario provided readers with a well-crafted composite of a man who was gifted in so many ways: “He was a skilled and meticulous man. He was modest and understated. He could play bridge, change a tire, fix a broken sink, tie a perfect Windsor knot, carve a beautiful fruit platter, and tell you exactly what he and Eleanor did on their first date (they went to see Nellie Lutcher)” is an excerpt. The richness in texture we are provided from this man’s life calls to mind words in the writings of the evangelist, St. Luke: “Much is expected from those to whom much has been given.” Mr. Addario did not disappoint. He was a long-time teacher and principal at Welland High and Vocational School. His teaching career there began in 1945 and on July 1, 1964 he was appointed principal, the post he held until June, 1969. He then became a superintendent with the Niagara South Board of Education. After his retirement, he served as an elected trustee on the public school board. Mr. Addario hired many on the teaching staff at Welland High during his time as principal. Among them were Bob Muir and his wife Heather, former Wellanders who now reside in Pelham. 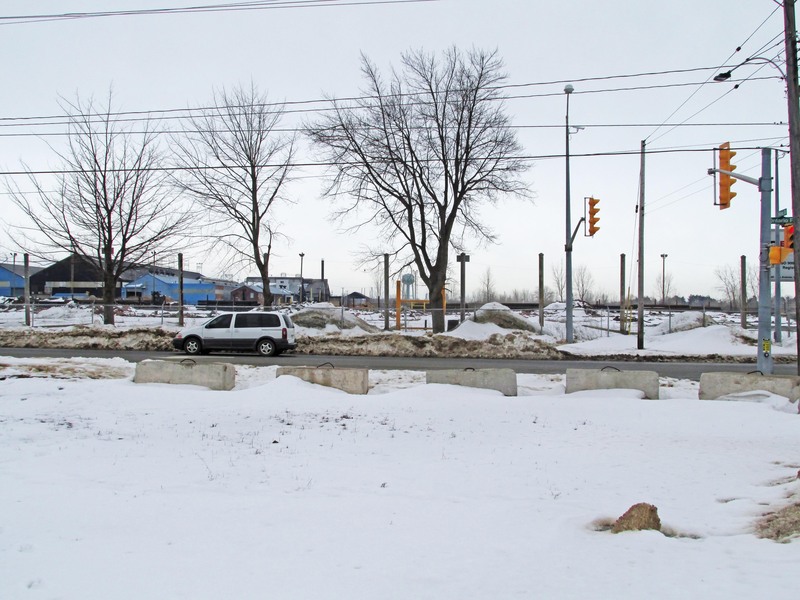 Heather Muir e-mailed: “Frank Addario was already a force of nature when we came to Welland. As principal of Welland High he hired Bob straight out of university and convinced him that Welland was a great place to teach. Bob accepted the offer to teach History and decided it would be just a couple of years before he would return to Sarnia. Welland High under Mr. Addario was a place of decorum, respect and dedication to excellence. These were qualities Mr. Addario exhibited and demanded from others. One of his greatest public challenges was the student strike (short lived, in September, 1968) over construction delays in the renovations to the school. He was firm in the face of defiance, as he spoke students realized that returning to class was the best course of action. Scriptural readings at the funeral Mass brought into relief the vocation in Mr. Addario’s life – master teacher, Rev. Jim Mulligan CSC said in his homily. The readings came from the prophet Isaiah (Old Testament), St. Paul’s Letter to the Romans (New Testament) and the Gospel – The Beatitudes from the Sermon on the Mount. The articulate priest referenced all three. Just one more lasting image of Frank Anthony Addario. 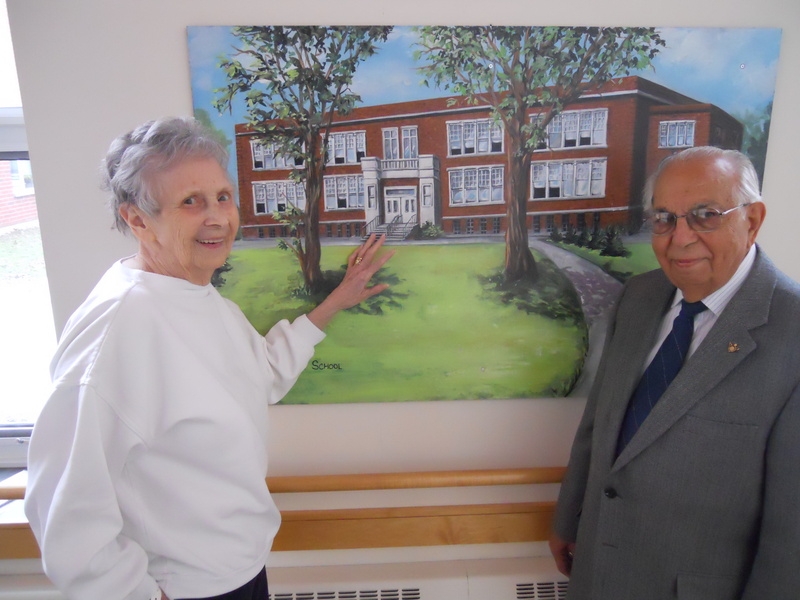 CAPTION FOR PHOTO: Frank Addario was honored to be present when a painting of Welland High became part of a gallery on display at Rapelje Lodge in 2013. Shown with him is Ruth Brocklebank, a Rapelje Lodge resident and former Welland High student. The painting is by Welland artist and muralist Darlene Kisur-dePagter. This entry was posted in Uncategorized on February 24, 2014 by fromareportersnotebook. At the foot of King Street. Pleasing palates on payday bonanzas earned with the sweat on their backs. With glasses of draught, or bottled OV and Kingsbeer and IPA. When the shiftwork was done. Who toiled at the P-H pipe-making mill. Mr. Page and Mr. Hersey. This entry was posted in Uncategorized on February 21, 2014 by fromareportersnotebook. Returned to one of the city’s outdoor ‘jewels’ the other day. It was before early-morning Sunday Mass. I’d heard the skating trails at Woodlawn Park were back in use a few days last week; in my book, they are amongst our recreational jewels. The trails still were covered by freshly-fallen flakes – a light dusting overnight and just after dawn. Still, the marks of a skater or maybe two could be seen on the large patch of ice nearest Woodlawn Road. I visited here often in years gone by, when the ice was groomed by city crews and local volunteers for use by recreational skaters and hockey players alike. The ribbons of ice that led into the woods provided getaways for figure-skater wannabes – they needed not worry about pucks flying past, or roughhousing hockey heroes bursting through and interrupting routines still in deep-concentration rehearsal mode. Choice times for this blades-of-steel enthusiast were pre-dawn hours or late evening, skating under the stars. The trails were best enjoyed with no one else in sight or on site, that is if pursuit and enjoyment of solitude are what matter most in one’s priorities. And when conditions were right, there was no better place to go. If lucky, smoke from a nearby home’s woodstove will be snaking into the starlit sky; from far off, the din of late night (or very early morning) partygoers will be heard but not necessarily experienced. Times and places such as this afford us opportunity to rendezvous with self and with what the year about to expire brought our way. (Recently, I’d found another inspirational venue, the college campus and walking trails, and especially at evening the lighted staircase that climbs to the peak of a towering berm). 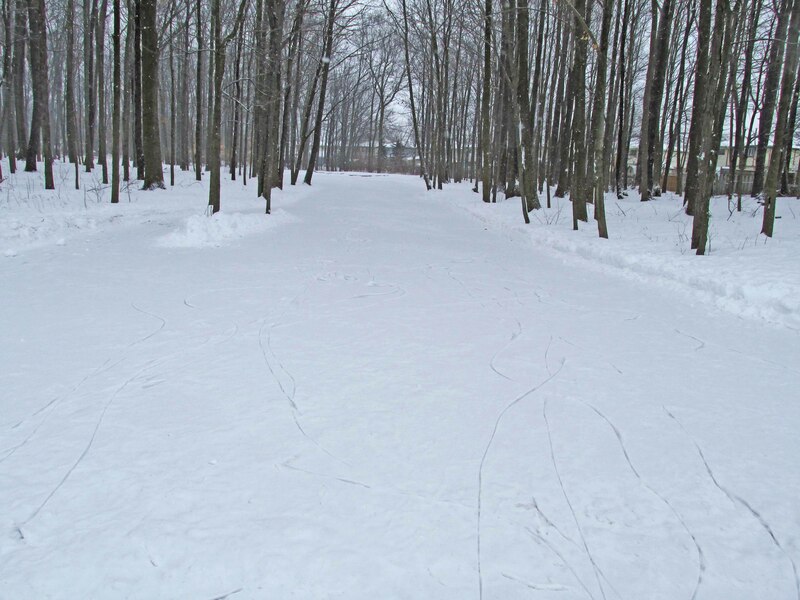 Park to trek across the ribbons of ice and into the woods. To my heart’s content, I was alone on powder-blanketed ice, blazing a trail as in years gone by when delicacies such as this still were regarded acts of beauty. And surprise, surprise – how it felt good to be like a kid again! One time or another in our lives, perhaps more depending on our sense of daring, we answer a call to be trailblazers – pioneers in a sense. You know the feeling, memories won’t let you forget. And those of Woodlawn Park visits from years ago among them still, the jewel in our midst. 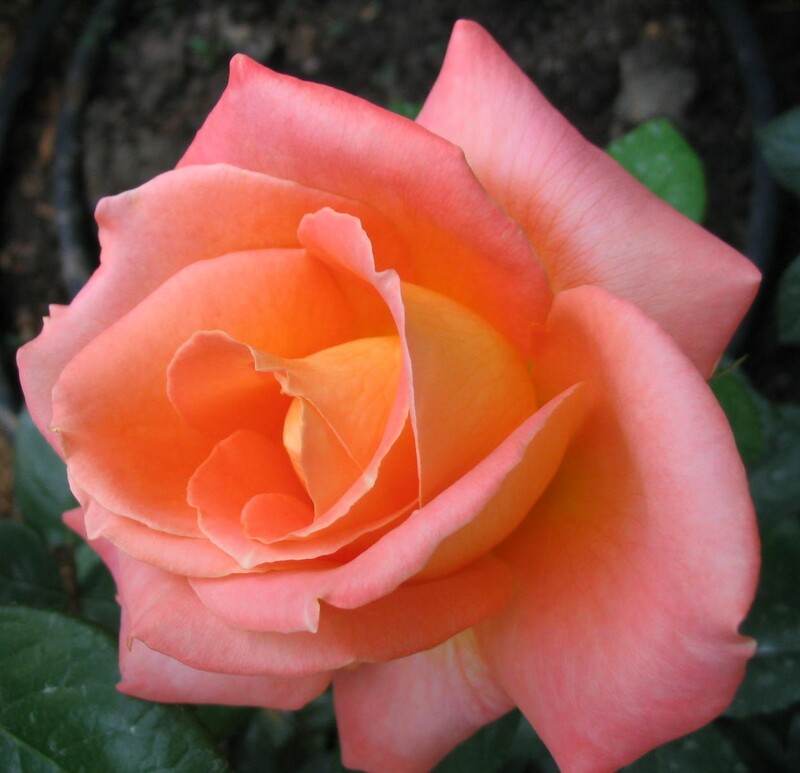 This entry was posted in Uncategorized on February 17, 2014 by fromareportersnotebook. I am learning to live with old age again. Anyone who has spent time with aging parents would have a handle on what I mean. This time, however, I am writing about our dog. Living with a dog who is slowing down due to age is not easy either. Buddy, a Springer/Lab mix, is crowding 11. In people years, if there is a bone of truth to this, he would be 70ish. I don’t know how this is calculated but one dog year is the equivalent of 7 of ours. Inexact, to be sure. This makes me second oldest in our household: three people, two pets – the other is a cat named Soot. For now, we two are close, what’s a couple years between man’s best friend and man? But Buddy turns 11 in the spring and he will leapfrog away of me in terms of age: Seventy-seven. Well, thereabouts. Compared to Buddy, I am a relative pup at 66. I should be happy. But I am not. These days, he sleeps a lot. Far more than he used to. 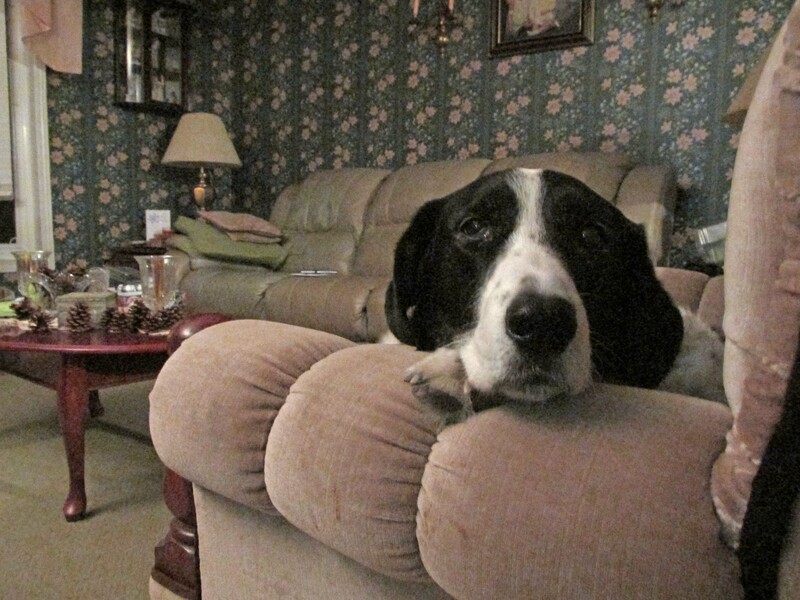 If we cannot find him on his sofa or in the downstairs TV room, we know where to look. There he is: in our bedroom, curled up on the bed. He also spends many nights there. Some time, he sleeps at the foot of the bed. Other times, you will find him asleep on my side and other times, on my wife’s. Occasionally, he tries snuggling between us, but that can make for cramped quarters. So one of us has to leave. Doggone it, most often it is me. He caused some worry a few times in the past month or so. While on our evening walks, he started limping. He favored his left hind leg and once, struggled even to make it across Woodlawn Road heading toward the college campus. At first I thought it was because of the bitter cold that we’d had. But then it happened again and it wasn’t even cold that evening. I gently coaxed him to the side of the road where I massaged his leg. After a few minutes he was good to go. Dogged determination got him through. Arthritis, maybe? Do dogs get arthritis? There are other signs, like bumps popping up along his back – probably cysts, someone said, and a cataract – a diagnosis from someone who knows far more about pooches than this old hound dog – growing in his left eye. I asked what this means. I gave it deaf ear’s reaction, I did not want to acknowledge the response. I thought about becoming his seeing-eye-human. Why not, I’m sure he would be my seeing-eye-dog if our roles were reversed. I limp from time to time, an old hockey-related injury from years ago coming back to haunt me. I’ve had a cataract removed. I have the aches and pains that come from “growing old” as a saying goes. When he was still a pup he earned the nickname “Buddy the anti-gardener”. Anything planted in our flower beds Buddy dug up when I wasn’t around. He dug it up with gusto. Nowadays I wish Buddy the anti-gardener was back. And Buddy the ball chaser and Buddy the rubber newspaper retriever. But he takes no interest in playtoys. There are days I find him with his head resting on one of my stray socks. Maybe it is his security blanket, I don’t know. Or maybe it is his security sock. Maybe its sole offers him a place of wellbeing. I don’t know. When I sat beside him recently, he lifted his big front paw and plopped it on my hand, a sign of friendship. I know that. Do dogs sense approach of a time when the “fever of life is over and the work is done”, as John Henry Newman wrote? I don’t know that. Some days, I think Buddy might know though. Buddy has me in a rut. I have been here before. I am living with old age again. Our Buddy’s; my best buddy’s. I am praying for a longer leash on life. This entry was posted in Uncategorized and tagged A former reporter and editor, Joe Barkovich, lives in Welland, Ont. on February 17, 2014 by fromareportersnotebook.